From left: Micah Thompson, Mahera Maihi, Api Tiapa and Hannah Pattullo with a cultural group in Papua New Guinea at the recent APEC summit. 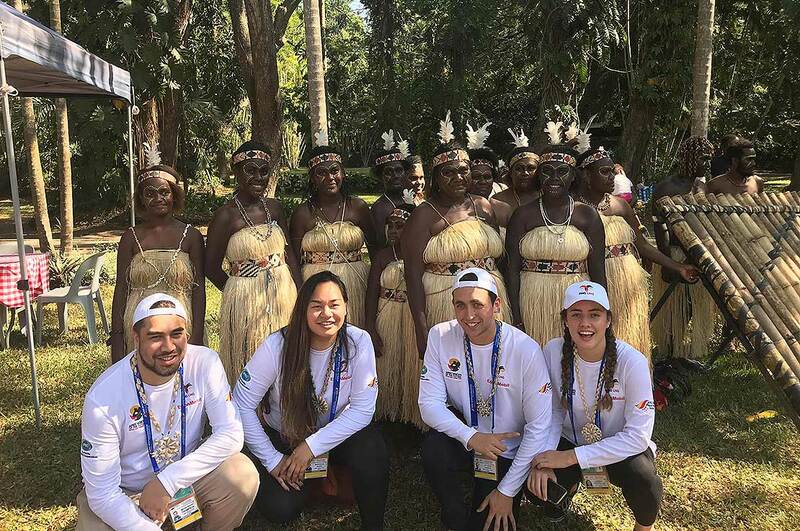 Massey master’s student Api Taiapa, Ngāti Porou, had the opportunity to see the cut and thrust of international politics up close and personal as a youth delegate at the recent APEC (Asia-Pacific Economic Cooperation) summit in Papua New Guinea. Mr Taiapa, who is completing a Masters in Industrial Organisational Psychology with the School of Psychology, was part of a New Zealand youth delegation to APEC funded by the Ministry of Foreign Affairs and Trade, APEC and supported by Massey’s Office of International Relations. Delegates got to stay on a cruise ship in Port Moresby while attending the APEC Voices of the Future summit which focused on the theme “Harnessing inclusive opportunities, embracing the digital future”. Mr Taiapa says along with experiencing the incredible diversity of Papua New Guinea culture and meeting CEO’s and business leaders, he got to see the President of China Xi Jinping and the Vice President of the United States Mike Pence speak, and witness the tense diplomacy around the superpowers. Mr Taiapa says the New Zealand youth delegation’s presentation was highly received because of its cultural inclusiveness. While New Zealand may not be a superpower, Mr Taiapa says people he spoke to at APEC saw us an important ‘softpower’ with a reputation as peacekeepers and an ability to work quietly behind the scenes. Inspired by the experience Mr Taiapa will continue to focus on his research into how tikanga Māori can be used to improve business practises around New Zealand, with a thesis exploring the relationship between mana and leadership and the implications of that on organisations.